As part of the regional leadership team for the Society of Children’s Book Writers and Illustrators, I get to be part of one of the coolest writer’s conferences in the world (literally) every summer. 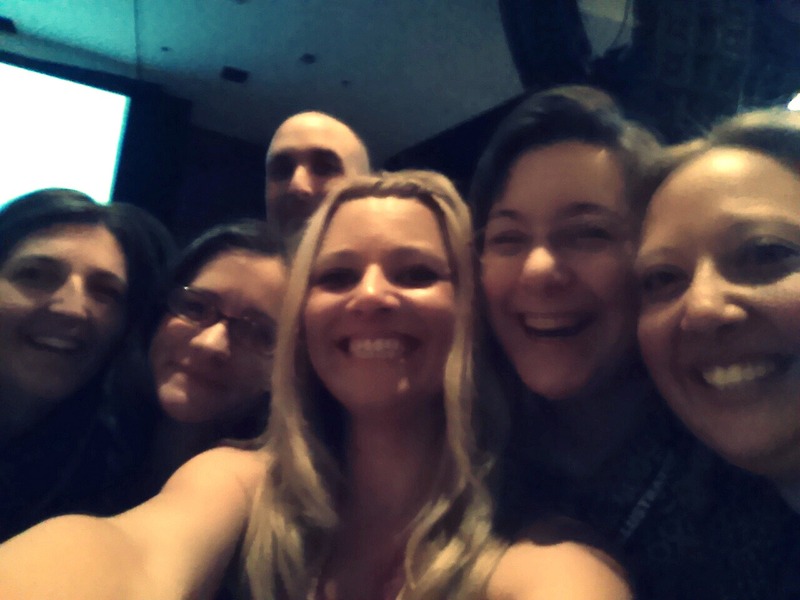 I’m always amazed at the caliber of speakers the SCBWI crew brings together. This year a few of my favorites were Tomie DePaola (if you don’t know who this is you need to go to the library and check out a few of his books or unfriend me now – sort of kidding, but seriously, he’s AMAZING and he’s created more than 200 children’s books, so I bet you know who he is and don’t even know that you know who he is), Judy Blume (an icon in the word of children’s literature), Stephen Chbosky (the dude responsible for Perks of Being a Wallflower…also the dude responsible for making me cry three times on the airplane as I read Perks), and Megan McDonald (author of the Judy Moody books, and many others – who stumbled into a conversation I was having as I waited for an elevator about tanning one’s bottom when mooning). There were too many amazing authors/illustrators to name them all, and each one of them inspired me in one way or another. 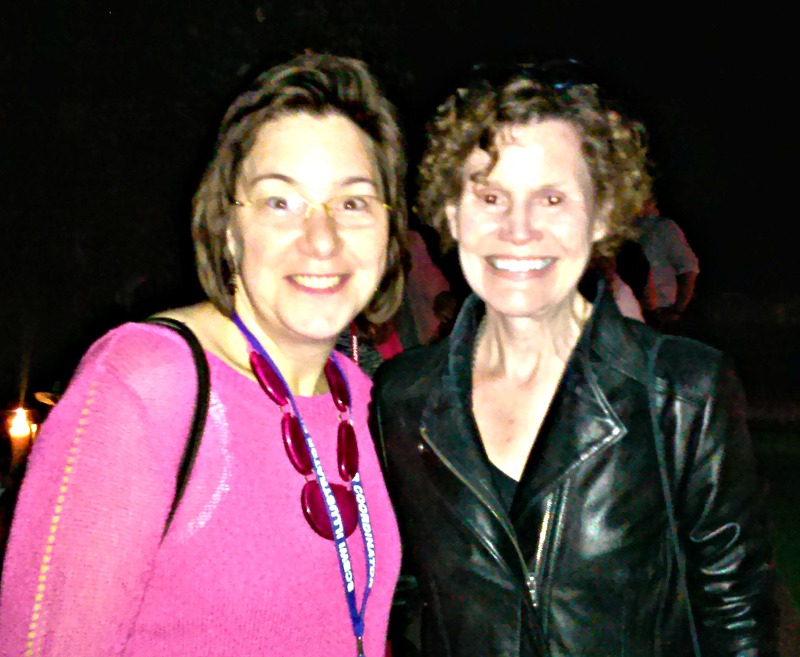 My friend Alicia and Judy Blume (one of the few celebrities I might geek out over hanging out with)! You know who else was inspiring? The 1200+ attendees in various stages of their careers, some of them making a huge leap of faith and commitment to their craft by signing up for the conference. Some well published, many pre-published, all supporting each other along the way. I have to say that is my favorite part of SCBWI and the annual conference in LA. Don’t get me wrong, spending time with authors and illustrators who have inspired my work or entertained me with their books as I grew up is totally cool, but what truly makes each conference so fulfilling are the friendships I make with other kid lit peeps, finding friends who can understand my weirdness because they are just as weird as I am, and connecting and watching them grow on their own author/illustrator journey. A quick selfie taken with a few old friends and a few new friends! While I was away, my son’s All-Star baseball team won third place (with my boy hitting 2 homers and pitching lots of strikes), my middle daughter was offered a contract with one of the biggest talent agencies based in Chicago, and my baby (who’s four, so not technically a baby anymore) may have inspired my little sister (who came to stay with my monkeys while I was away) to remain childless a few more years (as I say while my kids are fighting and screaming through the aisles of Target, “Free birth control.”). It was a busy and productive week for the Freeburg crew all the way around, and it was hard to be away from the special events going on back in Minnesota for my family. But the inspiration and new friends I come back from the conference with, make the time away well worth it. Cheers to another amazing event, and a million thanks to the SCBWI team who pulled it all together! I’m humbled to be counted as a member of that team. 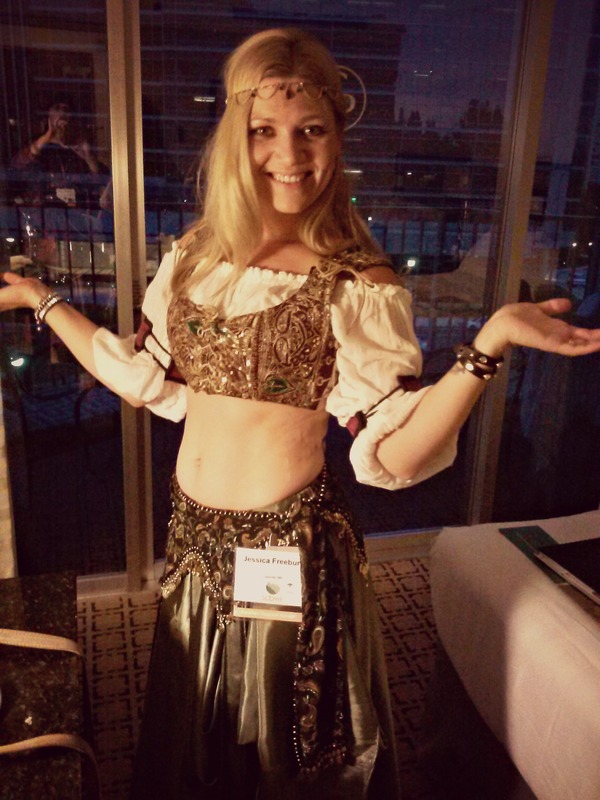 Just because this is one of the few times in life that you’ll ever see me in a belly dancer costume and because I promised the kind woman who let me borrow her costume when I randomly showed up at her door, introduced myself, and asked if she might have a Renaissance costume I could use, that I would share of picture of me in it…here I am, ready for the annual costume party.